Hollywood, FL, February 16, 2018 --(PR.com)-- AD1 Global, a South-Florida based hospitality development and management company, has completed a multi-million-dollar renovation of the Holiday Inn Viera-Melbourne. 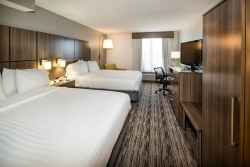 The comprehensive property-wide renovation featured a complete revamp of the guestrooms and inviting public spaces to provide sleek, contemporary furnishings, as well as modern interior design. The landscaping and exterior setting was also enhanced to showcase the property’s stunning Florida scenery. State-of-the-art Tesla and electric car-charging stations were also installed to accommodate environmentally friendly guests. “The extensive renovation underscores our ability to make opportunistic investments within mid to major markets and fully reposition the asset in a very short period of time,” said Daniel Berman, AD1 Global President. Situated in Melbourne, Florida, this hotel is positioned to take advantage of transient traffic from I-95, and local tourism. The property is only 0.7 mi (1.2 km) from Brevard Zoo and within 6 mi (10 km) of Space Coast Stadium and Viera East Golf Club. The Space Coast Iceplex and Turtle Creek Golf Club are also within 6 mi (10 km). “Commercial activity continues to strengthen in the Melbourne-Viera area making it a prime destination for business, government, military and leisure travelers,” said Berman. The resurgent Space tourism industry, courtesy of Space X, also benefits the property and local economy. Along with a restaurant, this smoke-free hotel has an outdoor pool and a fitness center. Free WiFi in public areas and free self-parking are also provided. Other amenities include a bar/lounge, a business center, meeting rooms and electric car charging stations. All 128 rooms have Wifi access, flat-screen TVs with cable channels, and conveniences like refrigerators and coffee makers. Room service, pillow menus and free newspapers are among the other amenities available to guests. AD1Global is a hospitality development and management company located in Hollywood, Florida. The company excels in all facets of the hospitality industry, ranging from the acquisition of existing hotels, new developments, renovations, daily operations and management contracts. AD1 Global offers complete and comprehensive hotel solutions tailored to the specific needs of each individual property. The company’s goal is to continuously improve the work-process resulting in highly profitable hotels.